WAAG Society's Fablab published 10 recipes to help teachers (re)discover their inner-inventor & get skilled in maker education. In 2015, WAAG Society's Fablab organized the first Teacher Maker Camps. In this four-day pressure cooker, they introduce teachers to the world of maker education and help them develop their 21st century skills. Teachers use scrap and craft materials, 3D printers, digital fabrication, electronics, and programming tools from the FabLab both to bring their ideas to life and to rediscover their inner-inventor. But most of all, they experience what it is like to step out of their comfort zone; to experiment and do things they have never done before; and to become a learner again. 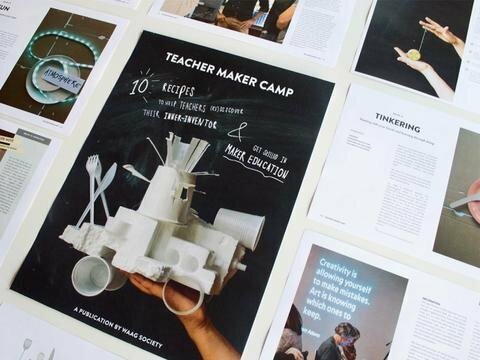 We have collected the best recipes and secret ingredients of our Teacher Maker Camps and share them via this publication. With the distribution of this cookbook, we intend to transfer our experience and knowledge. We aim to inspire others to start transferring their love for learning through making by creating their own, local Teacher Maker Camp. Enjoy! This publication has been made by: Mariska Hamelink, Ista Boszhard and Karien Vermeulen, edited by Laurie Skelton and designed by Jimena Gauna. It's a free download under a CC BY-NC-SA license.